When you think of tracking your competitors, what do you think of? Reading up on their product pages, getting feedback from customers, maybe even reading online reviews of their products. But what about their partner testimonials? Changes to their office locations? 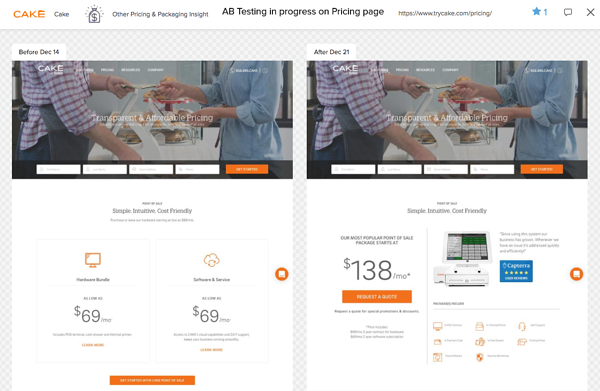 A/B tests on key landing pages? These types of competitive intelligence are among the top 10 most engaging pieces of competitive information a company can use, as revealed by an analysis of hundreds of thousands of CI datapoints surfaced by Crayon. In other words, these are the types of competitive information that drive the most discussion and action by the teams monitoring their competitors’ complete digital footprints. Be sure you’re tracking each of these CI types because they offer endless opportunities to get ahead of your competitors. Updates to a company’s app store listings can be incredibly revealing when it comes to bugs, beta features, and more. Given that the audience for app release notes are often customers (if anyone’s reading them at all), these updates provide a less manicured view into the specifics of a company’s app. You may find mentions of recent bugs and you may get the earliest notice of a new feature being released before its announcement. Pricing and packaging changes are, not surprisingly, one of the most engaging types of intelligence you can find. Updates to pricing or packaging are critical to share with internal teams like sales and can also affect marketing campaigns, positioning principles, and more. On top of that, these types of changes can indicate broader shifts in a competitor’s strategy - moving up or down market, expanding or focusing product lines, etc. Marketing tests - such as an A/B test of a call to action or landing page - can be particularly useful in giving a view into what your competitors are planning to do in the future. If you knew what your competitors were going to do before it happened, what would you do differently? Monitoring campaign tests gives you that exact opportunity. Also, by monitoring both the test and what gets rolled out in the future - the winning variation - you can learn from your competitor’s heavy lifting what works and what doesn’t in your industry. Quite a few companies will publish their product roadmaps to public or somewhat hidden customer sites to share with their users. Undoubtably, getting a view into what your competitors are developing and the direction their product is headed is incredible intel to share and discuss with product and executive teams alike. A competitor’s Adwords campaigns have multiple components - from the keyword to the ad to the landing page - and they reveal how a competitor thinks about their marketing efforts. Monitoring and analyzing these campaigns can provide great inspiration for your own campaigns, whether on Adwords or organic lead generation efforts. Monitoring a competitor’s product page goes beyond reading the feature details and positioning statements. Truly keeping tabs on your competitor’s moves means capturing when features have been removed as well as added. Removing a feature can be particularly thought-provoking and actionable because this change takes effort but results in offering less to their customer base. Is it because they lost specialized resources to support that feature? Is it because they’re shifting to a different target market? Is it because they will be relaunching a new version of that feature? Planning for the different scenarios when you identify this change is key to taking advantage of competitive opportunities. Customer testimonials aren’t the only types of testimonials that provide competitive intelligence value. In fact, partner testimonials garner above average engagement, perhaps because the type of partner and type of partnership can reveal a lot about a company’s strategy - which audiences are they trying to appeal to with this partnership? For which use cases are they turning to partners instead of building themselves? On top of that, partners represent an audience that is not exclusive - if your company doesn’t yet have a relationship with that partnering company, this could be the trigger to reach out. One commonality of each of these engaging competitive intelligence types is that they signal so much by a seemingly simple change. Executive team updates are no different in that regard - the removal of a CEO or the addition of a new VP Services is big news inside and outside the company. What’s needed when a change like this occurs is to discuss its meaning and share the takeaway with impacted teams. For example, if the VP Engineering is removed, that could mean that there have been challenges with product innovation or reliability and that there could be a gap in product advancements while the company has no engineering leader. This insight - the takeaway determined by analyzing the intelligence - is great input for the sales team’s competitive positioning or marketing team’s competitive campaigns. Office locations are meaningful signals of a company’s growth and focus, especially for industries that are even more locally focused in their go to market strategy. Oftentimes, additions of office locations may come before an announcement of new funding, hiring plans, or product initiatives tied to the new location. Landing page and campaign changes are filled with discussion-worthy datapoints - inspiring new marketing tests of your own, revealing lessons of the before-mentioned A/B tests, or analyzing how a competitor is dividing their marketing focus across channels and promotions. This type of intelligence is particularly great for engaging marketers focused on demand generation campaigns so that their campaigns are set up to be more successful in the context of the competitive landscape. These are just 10 of the many types of competitive intelligence needed to get a full picture of your competitors’ moves. Ensure you’re tracking these and every aspect of your competitor’s digital footprint to find actionable intelligence for every team in your business.